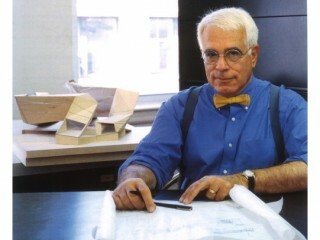 Peter Eisenman (born August 11, 1932 in Newark, New Jersey) is an American architect. Eisenman's fragmented forms are identified with an eclectic group of architects that have been labeled as deconstructivists. Eisenman's theories on architecture pursue the emancipation and autonomy of the discipline and his work represents a continued attempt to liberate form from all meaning, a struggle that most find difficult to accept. He always had strong cultural relationships with European intellectuals like his English mentor Colin Rowe and the Italian historian Manfredo Tafuri. The work of philosopher Jacques Derrida is a key influence in Eisenman's architecture. Eisenman first rose to prominence as a member of the New York Five (also known as the Five Whites), five architects (Eisenman, Charles Gwathmey, John Hejduk, Richard Meier, and Michael Graves) some of whose work was presented at a CASE Studies conference i n 1967. Eisenman received a number of grants from the Graham Foundation for work done in this period. These architects' work at the time was often considered a reworking of the ideas of Le Corbusier. Subsequently, the five architects each developed unique styles and ideologies, with Eisenman becoming more affiliated with the Deconstructivist movement. Eisenman's focus on "liberating" architectural form was notable from an academic and theoretical standpoint but resulted in structures that were both badly built and hostile to users. The Wexner Center, hotly anticipated as the first major public deconstructivist building, has required extensive and expensive retrofitting because of elementary design flaws (such as incompetent material specifications, and fine art exhibition space exposed to direct sunlight). It was frequently repeated that the Wexner's colliding planes tended to make its users disoriented to the point of physical nausea; in 1997 researcher Michael Pollan tracked the source of this rumor back to Eisenman himself. In the words of Andrew Ballantyne, "By some scale of values he was actually enhancing the reputation of his building by letting it be known that it was hostile to humanity." Eisenman's House VI, designed for clients Richard and Suzanne Frank in the mid 1970's, confounds expectations of structure and function. Suzanne Frank was initially sympathetic and patient with Eisenman's theories and demands. But after years of fixes to the badly-specified and misbegotten House VI (which had first broken the Franks' budget then consumed their life savings), Suzanne Frank was prompted to strike back with Peter Eisenman's House VI: The Client's Response, in which she admitted both the problems of the building, as much as its virtues. Eisenman has also embarked on a larger series of building projects in his career, including the recently completed Memorial to the Murdered Jews of Europe in Berlin and the new University of Phoenix Stadium in Glendale, Arizona. His largest project to date is the soon-to-be completed City of Culture of Galicia in Santiago de Compostela, Spain. Eisenman is featured in the 30 minute 2008 film Peter Eisenman: University of Phoenix Stadium for the Arizona Cardinals where he provides a tour of his recent construction. * House VI (Frank residence), Cornwall, Connecticut, Design: 1972. View the full website biography of Eisenman Peter.